Queen Māyā of Sakya (Māyādevī) was the birth mother of Gautama Buddha, the sage on whose teachings Buddhism was founded, and the sister of Mahāpajāpatī Gotamī, the first Buddhist nun ordained by the Buddha. In Buddhist tradition Maya died soon after the birth of Buddha, generally said to be seven days afterwards, and came to life again in a Buddhist heaven, a pattern that is said to be followed in the births of all Buddhas. Thus Maya did not raise her son who was instead raised by his maternal aunt Mahapajapati Gotami. Maya would, however, on occasion descend from Heaven to give advice to her son. Māyā means "illusion" in Sanskrit. Māyā is also called Mahāmāyā ("Great Māyā") and Māyādevī ("Queen Māyā"). In Tibetan she is called Gyutrulma and in Japanese is known as Maya-bunin (摩耶夫人). Also Sinhalese known as මහාමායා දේවී (Mahāmāyā Dēvi). 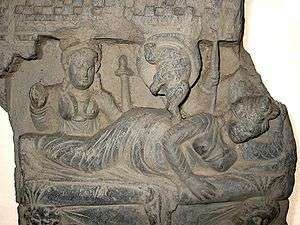 The birth of Siddhārtha Gautam Buddha from Madhesh, Gandhara, 2–3rd century CE. Her beauty sparkles like a nugget of pure gold. She has perfumed curls like the large black bee. Eyes like lotus petals, teeth like stars in the heavens. Although sometimes shown in other scenes from her life, such as having a dream foretelling her pregnancy with Gautama Buddha or with her husband King Suddhodana seeking prophecies about their son's life, shortly after his birth, she is most often depicted whilst giving birth to Gautama, an event that is generally accepted to have taken place in Lumbini in modern-day Madhesh. Maya is usually shown giving birth standing under a tree and reaching overhead to hold on to a branch for support. Buddhist scholar Miranda Shaw, states that Queen Maya's depiction in the nativity scene follows a pattern established in earlier Buddhist depictions of the tree spirits known as yaksini. Māyā married King Śuddhodana (Pāli: Suddhodana), the ruler of the Śākya clan of Kapilvastu. She was the daughter of King Śuddhodhana's uncle and therefore his cousin; her father was king of Devadaha. Queen Māyā's white elephant dream, and the conception of the Buddha. Gandhara, 2-3rd century CE. Māyā and King Suddhodhana did not have children for twenty years into their marriage. According to legend, one full moon night, sleeping in the palace, the queen had a vivid dream. She felt herself being carried away by four devas (spirits) to Lake Anotatta in the Himalayas. After bathing her in the lake, the devas clothed her in heavenly cloths, anointed her with perfumes, and bedecked her with divine flowers. Soon after a white elephant, holding a white lotus flower in its trunk, appeared and went round her three times, entering her womb through her right side. Finally the elephant disappeared and the queen awoke, knowing she had been delivered an important message, as the elephant is a symbol of greatness in India. According to Buddhist tradition, the Buddha-to-be was residing as a bodhisattva in the Tuṣita heaven, and decided to take the shape of a white elephant to be reborn on Earth for the last time. 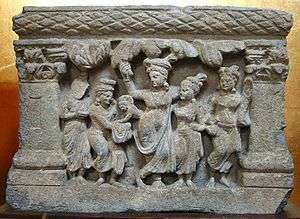 Māyā gave birth to Siddharta c. 563 BCE. The pregnancy lasted ten lunar months. Following custom, the Queen returned to her own home for the birth. On the way, she stepped down from her palanquin to have a walk under the Sal tree (Shorea robusta), often confused with the Ashoka tree (Saraca asoca), in the beautiful flower garden of Lumbini Park, Lumbini Zone, Nepal. Maya Devi was delighted by the park and gave birth standing while holding onto a sal branch. Legend has it that Prince Siddhārtha emerged from her right side. It was the eighth day of April. Some accounts say she gave him his first bath in the Puskarini pond in Lumbini Zone. But legend has it that devas caused it to rain to wash the newborn babe. He was later named Siddhārtha, "He who has accomplished his goals" or "The accomplished goal". Scholars generally agree that most Buddhist literature holds that Maya died seven days after the birth of Buddha, and was then reborn in the Tavatimsa Heaven, where the Buddha later preached the Abhidharma to her. Her sister Prajāpatī (Pāli: Pajāpatī or Mahāpajāpatī Gotamī) became the child's foster mother. After Siddhartha had attained Enlightenment and become the Buddha, he visited his mother in heaven for three months to pay respects and to teach the Dharma. Referring to the prophetic dream Queen Maya had prior to conception, the life story of the Buddha according to the Pali Cannon say that his mother did not engage in sexual activity or entertain any thoughts of other men during her pregnancy. It does not say that Siddhartha was conceived without sexual activity between his parents. However, some parallels have been drawn with the birth story of Jesus. Z. P. Thundy has surveyed the similarities and differences between the birth stories of Buddha by Maya and Jesus by Mary and notes that while there may have been similarities, there are also differences, e.g. that Mary outlives Jesus after raising him, but Maya dies soon after the birth of Buddha, as all mothers of Buddhas do in the Buddhist tradition. Thundy does not assert that there is any historical evidence that the Christian birth stories of Jesus were derived from the Buddhist traditions, but suggests that "maybe it is time that Christian scholars looked in the Buddhist tradition for the sources of the idea". Other scholars have, however, rejected any influence, e.g. Paula Fredriksen states that no serious scholarly work places Jesus outside the backdrop of 1st century Palestinian Judaism. Eddy and Boyd state that there is no evidence of a historical influence by outside sources on the authors of the New Testament, and most scholars agree that any such historical influence on Christianity is entirely implausible given that first century monotheistic Galilean Jews would not have been open to what they would have seen as pagan stories. Some historians have asserted that the idea that Buddhism influenced Christianity in this regard is anachronistic, and that the idea that Maya was a virgin only developed after the advent of Christianity. According to scholar Thomas Boslooper, "It is obvious that ancient pre-Christian Buddhism knows nothing of the virginity of the mother of Buddha." The oldest accounts of his ancestry mention nothing abnormal about his birth. In one place he is said to be wellborn on his mother's and father's side for seven generations back (Dīgha Nikāya i. 113) Elsewhere when the Buddha refers to the Lady Māyā as his mother, he also says that his father is King Suddhodana. In the early tradition it was believed that conception took place with the combined contributions of the father, the mother and the "genius," which is to say, the being to be born, Gandharva. Wikimedia Commons has media related to Queen Maya. ↑ Shaw, Miranda (2006). Buddhist Goddesses of India. Princeton University Press. p. 38. ISBN 978-0-691-12758-3. ↑ Shaw, Miranda (2006). Buddhist Goddesses of India. Princeton University Press. p. 51. ISBN 978-0-691-12758-3. ↑ "Life of Buddha: Queen Maha Maya's Dream (Part 1)". Buddhanet.net. Retrieved 2012-03-09.